Easter eggs have been part and parcel of the MCU since, seemingly, the dawn of time. Thor: Ragnarok is no different. Except, maybe it’s a little different. 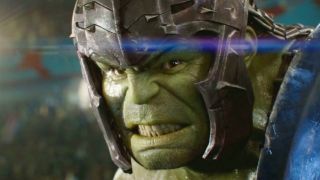 President of Marvel Studios, Kevin Feige, actually took time out to reveal his favourite Easter egg from the upcoming movie and – here’s the catch – it’s in the very first second of the Thor: Ragnarok SDCC trailer. Speaking at a press junket for the film, as reported by Screen Rant, Feige uncharacteristically opens up, prior to the movie’s release, about one of the hidden background Marvel nods. The shot of Sakaar’s skyline, which you can see below, is dominated not only by the gladiatorial arena on the right, but by the Grandmaster’s Palace (Jeff Goldblum doesn’t do understated, folks), which is adorned with weird-looking faces. So, get flicking through your comic books and get your magnifying glasses out, because those faces will look familiar to some of you. Some suggestions have already included Beta Ray Bill, who manages to wield Mjolnir and inherit Thor’s powers in the comics, and also the God of War (not that one) Ares (no, not that one either). Greek gods in the MCU, anyone?